Amazing, how these sorcerers develop new twist and turns daily in their ongoing shem-sham of shame. Because they Believe not the Truth in Righteousness, and So God has sent them Strong delusion and they believe the Lie, they go to great lengths to make God, obey them. Behold…”New and Improved” sorcery codes….brought to you by the Sinai-GOG of Satan and their proselytes made two fold the children of hell. Biblical authorities (hahahahhahahha) have expressed their belief that we are now in the middle of the Messianic era. A recent review of Bible Codes found in Leviticus 23-25 points to the arrival of the Messiah during late September or early October of this year. Rabbi Mattityahu Glazerson, international Bible Codes authority, reveals multiple references to the Messiah and King David, from whom the Messiah is descended, in a new video. The first code that Glazerson points out is the phrase Moshiach yavo (Messiah will come). He goes on to point out the word b’Sukkot (on Sukkot), the Jewish holiday otherwise known as the Feast of Tabernacles. A third code are the Hebrew letters tav, shin, ayin and vav (תשעו) whose numerical values add up to 776. This is a clear reference to the Hebrew year 5776, which began on sundown on Sunday, September 13. In other columns in the table, Glazerson points out that the word David and also the words ben Yishai (son of Jesse, a reference to David) are found parallel to the code Moshiach yavo (Messiah will come). Glazerson reminds his viewers that codes which appear parallel in a table are thought to have a particularly strong relationship. The table from which these Bible Codes are derived comes from the Book of Leviticus, chapters 23-25. In a manner that’s unusual in his Bible Codes videos, Glazerson reads and translates all or part of multiple verses from these chapters. In this way, he establishes that the Codes are relevant to the subject of the Biblical text itself, which mentions shmittah, yovel (Jubilee) and the holiday of Sukkot. 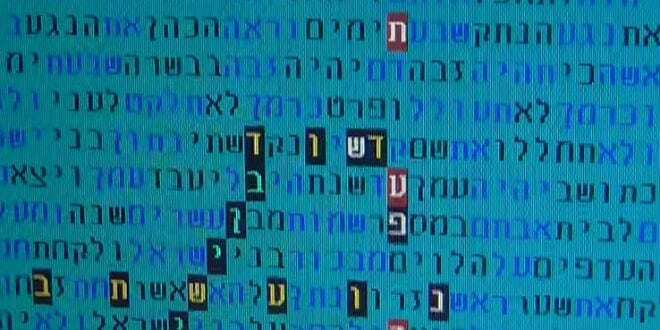 “I want to emphasize that this table appears in the location in the Torah (Bible) where the verses speak about Sukkot.This is significant because part of the importance of a table of Torah Codes is the location that it appears in the Torah,” Glazerson told Breaking Israel News. Glazerson also quotes Leviticus 25:49 “Or his uncle or his cousin shall redeem him.” The Hebrew word for uncle is dod and the Hebrew word for cousin is ben dod, which literally means [the] son of [the] uncle. This is significant, because in modern Hebrew, dod is spelled exactly the same as David. Only the vowel points are different. So the verse “Or his uncle or his cousin shall redeem him” could be understood to mean David or the son of David shall redeem. When asked to reflect about all these signs of the Messiah’s imminent arrival, Glazerson told Breaking Israel News, “The fact that Rabbi Kanievsky speaks so much about it makes it interesting. [Before recently] he would not speak clearly about Mashiach (Messiah). Complete…Hocus Pocus………The Good News is Christ Jesus will destroy this Viper at his coming !